The 2010/2011 NHL season has come to an end, and while it didn’t finish up at all the way we wanted (especially thanks to a crowd of douchebags), the Canucks gave us one of the most exciting season’s we’ve had in 17 years, and I’m glad we got to experience so much of it in person. And a huge part of being there to take it in was being able to take Isaac with us. For those unaware, Rogers arena applies the same rule to babies as airlines do: they can attend, in your arms, until they’re 2 years old (after that, you need to buy them a seat of their own). There are also a few other family-friendly amenities and services at the arena that make bringing baby along a bit easier. All of the washrooms have change tables (usually near the handicapped stall), but there are also family/accessible washrooms at either end of the arena (sections 103, 109 and 319) with a change table, chair and sink. They’re well-used, so hunkering down to nurse (especially over an intermission) seems like it’d be a tad inconsiderate to your fellow parents, but it’s a much less chaotic space to change a baby than the regular washrooms. 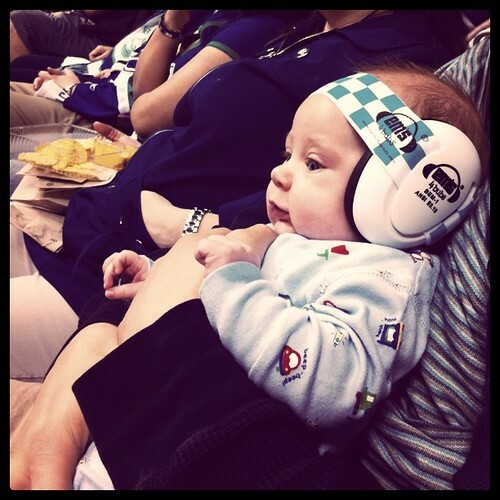 You can also bring your stroller right into the arena with you and check it at customer service (section 114 and 310). I’m thinking this would be super handy for heavier babies, or even if you’ve bought your toddler a seat (bonus tip: Guest Services also provides free booster seats – deposit required!) and he or she isn’t so good with the walk to and from your vehicle or transit to get to and from the arena. In addition to the arena amenities, there are a few things we always bring along to make sure Isaac’s comfortable (and we don’t miss much of the action). A baby sling. Isaac will curl up in pretty much any carrier and crash out after a short walk. We’ve found the sling works best for games, because it keeps him close without being bulky. It also works equally well for sitting as standing, and we don’t have to wrestle it on and off as we pass Isaac between us. Bonus: we can drape the tail of the sling over his head to block out some of the atmosphere if he’s getting overstimulated. A convenient nursing setup. This is obviously a personal preference thing, but during a 3 hour game, a baby’s going to need to eat at least once, and it’s best to be prepared. There isn’t any extra elbow room to be wrestling with pulling your shirt half-off, or fiddling with complicated snaps and straps, so any garment (nursing-specific or not) that gives you quick, easy access to nurse your baby is going to be key. I also use a nursing cover because a) I’m a giant prude and don’t enjoy the idea of flashing 18,000 of my closest friends and b) the cover blocks out distractions so Isaac focuses on eating rather than everything else. Ear Protection. If I hadn’t found this, I wouldn’t bring Isaac to the games, period. He’s got a lifetime to ruin his own hearing with whatever noise kids are listening to by the time he’s old enough to annoy me with his musical preferences. While he’s young, I’ll try my best to preserve he hearing he’s got. I’ve even found that the music and ambient noise at the games has gotten so loud, we’ve been bringing earplugs for ourselves as well. Has it always been that way, or am I just getting old and crotchety? Anyhow, the only earmuffs I’ve found for the tiny set are ems 4 bubs. The headband earmuff cups are extra small to fit little ears, but still offer 22dB noise reduction. The headband (instead of the over-head bridge that regular earmuffs have) ensures even pressure around your baby’s still malleable head. Locally I’ve found them at Hip Baby on West 4th, or you can order them online. And that’s pretty much it. We plan on reprising our hockey plan for baseball and soccer games this summer, and maybe football in the fall. After all, he actually seems to have a pretty good time watching the big boys play. 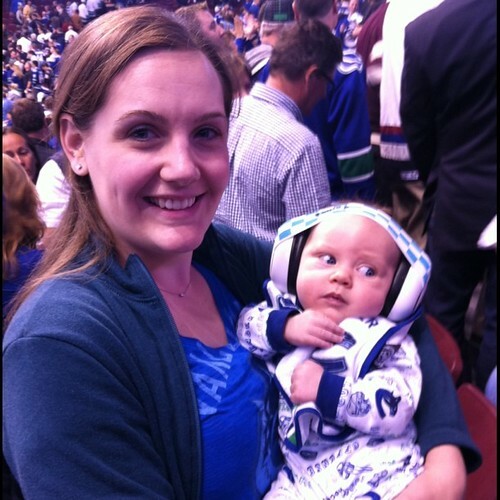 I kind of assumed that Rogers Arena distributed baby earmuffs to parents. I guess, in retrospect, that’s a pretty random assumption. Coincidentally, we were actually at Nat Bailey for the home opener on Friday night with a group of my colleagues. In the BBQ area no less, which is excellent fly-ball territory. Though we didn’t bring along a helmet for Isaac. Next time I suppose.